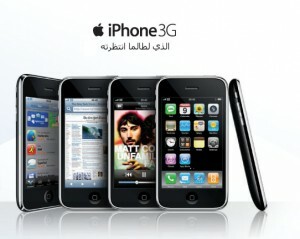 Home > News > Reserve a Mobily iPhone 3G now! Mobily (Saudi Arabia’s second mobile phone carrier) is now offering the ability to reserve your iPhone 3G so you will be given a priority over others when you want to purchase the device on launch date. According to Mobily “this does not mean that you will be guaranteed a device as it will be subject to availability”. Just fill the form located at Mobily’s iPhone page (English and Arabic sites). Enter your name, phone number, email, ID number and city. You will receive a confirmation e-mail. Click the link in the email. You will receive an SMS from Mobily with your “access code” to purchase your booked iPhone. Just present the access code to the sales agent on launch day which is rumored to be the 22nd of February. Mobily’s site also mentions: “Now officially in Saudi Arabia. Be the first to get it from Mobily, the only official provider. With full support from Apple.” Which is interesting because Apple might open their own support center in Saudi Arabia based on that text.